A few months ago the Catholic Worker network in England decided to embark on a series of "Faith and Resistance Retreats" as a basis of nonviolently confronting the war & the war machine and deepening our broader sense of community beyond our specific projects & living/working situations. The first was timed to mark the 30th. 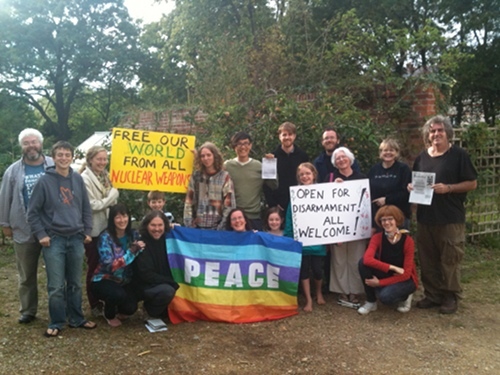 anniversary of the original Plowshares 8 action and to nonviolently confront Britain's ongoing production and refinement of nuclear weapons at Aldermaston. As we gathered in Oxford last Saturday, word was coming through from Dublin that all wasn't going well for the Tony Blair autobiography book launch tour. The author was being greeted with a hailstorm of eggs, shoes and dissent. It sounds like it was an egg splat heard around the world. It has nourished a mass nonviolent movement in England & beyond of moving the Blair's bio into the "crime section" of whatever book store you find it in and has directly lead to the cancellation of the London leg of his tour slated for Picadilly this week. By Sunday morning our numbers included Australian, Dutch, English, Irish, Malaysian Swedish and U.S. folks, Catholic Workers, students, lecturers, musicians, mothers, fathers, priest, supporters of Totenham, Villa, Wednesday, Man United, Oxford F.C. and some people (believe it or not) with no interest at all in football! We celebrated mass outside and this was followed by a go around and a check in - of introductions and how we felt presently about the war and the war machine and the potential for resistance to it. The general feeling was distress with the general disengagement with the war and gratitude that we could gather together to facilitate some resistance. We then gathered in the rotunda for a talk on the Plowshares movement. I gave a talk using the academic work on the movement undertaken by Sharon Nepstead "Religion and War in the Plowshares Movement" http://www.cambridge.org/us/catalogue/catalogue.asp?isb...17670 . Based on surveys and interviews with plowshares activists, this is a fine objective look at the plowshares movement from the outside in and I can't recommend it highly enough. THIS IS A REALLY REALLY IMPORTANT BOOK! It is particularly good on the problems, and otherwise, of transfering the Plowshares actions outside the U.S. context. I also shared from personal experiences with three plowshares communities on 3 continents in which I have participated. Following lunch we were joined by Brian Larkin from Trident Ploughshares http://www.tridentploughshares.org/index.php3 who brought us up to speed on what is happening at the nearby Aldermaston Atomic Weapons Establishment. The news is not good! We also heard more about where the Trident Ploughshares movement is at 14 years into their struggle to rid Britain of nuclear weapons. 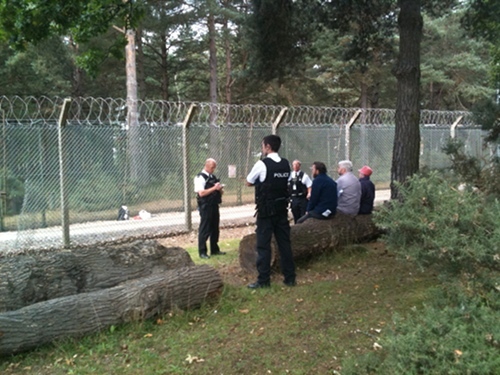 We then broke up into action and solidarity groups to prepare for Monday at Aldermaston. By Monday evening a group of us were gathered at Newbury Police station to welcome out Susan, Martin and Chris. They return to court in mid-December as the Attorney General decides whether the will be charged under the SOCPA anti-terror legislation. They had cut their way into Aldermason nuclear bomb factory http://www.indymedia.ie/article/97586 The rest of us had gathered at the gate to reflect on the nature of this demonic locale and what nonviolent resistance we can offer to it. The rhythym of nonviolent resistance and solidarity continues. It is our only hope against the escalating war and the war machine. one at the Bannister Federal Complex. There's no doubt that the plant has an economic impact on Kansas City. economy, and why so many people favor construction of the plant. a summery of the different sentencing outcomes for all 14 defendants. "Hurry and Wait" for Catholic Workers at Newbury Court House today! Ploughshares activists Chris Cole, Sr. Susan Clarkson from St. Francis House/ Oxford Catholic Worker and Fr. Martin Newell from Giuseppe Conlon House/ London Catholic Worker are presently in Newbury Court for a plea hearing. They are charged under SOCPA legislation with "criminal damage" and "criminal trespass". Charges arise out of their Sept '09 actions at Alderemaston (nuclear) Weapons Establishment (AWE). Latest report states that today's proceedings have been held up due to Ministry of Defense forgetting to bring papers to court. MOD have gone to fetch them. So it's "hurry up and wait" down at the old Newbury court house presently. Ploughshares activists Chris Cole ("BAE Ploughshares" 1993), Sr. Susan Clarkson ("Riverside Plowshares" 2003) from St. Francis House/ Oxford Catholic Worker and Fr. Martin Newell ("Jubilee 2000 Ploughshares") from Giuseppe Conlon House/ London Catholic Worker appeared in Newbury Court for a plea hearing Thursday January 6th.. The three are charged under SOCPA legislation with "criminal damage" and "criminal trespass". 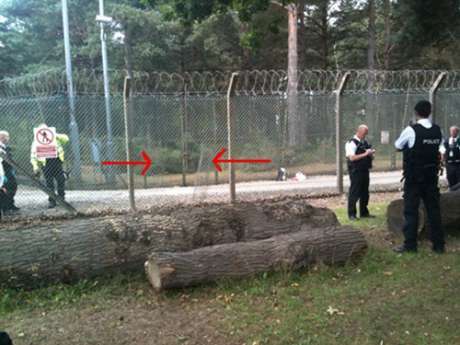 Charges arise out of their Sept '09 actions at Aldermaston (nuclear) Weapons Establishment (AWE). ..........must be a good sign! Here's "License to Kill" going out to Sr. Susan a big Dylan fan!